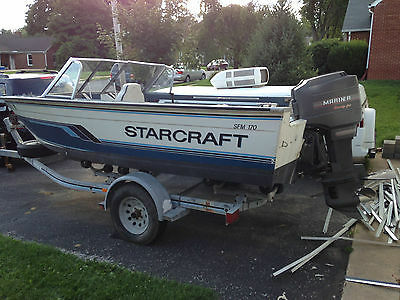 1992 Starcraft SFM 170 17 FT Aluminum boat only, the hull and everything attached to it except the motor, controls and trailer. 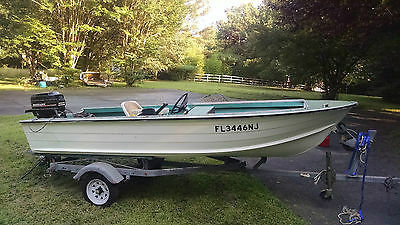 I am willing to sell the matching trailer and 70HP mercury engine to the winning buyer if interested. The boat is in fair condition and all around a pretty nice set up, 20 gallon inboard gas tank removable live well set up. seats on the bow and 3 pedal stool seats, 2 bilge pumps 1 auto and one controlled by a switch. The seats are no mounted to the floor and will need new hardware to do so, I used it for crabbing and needed the room. Lights are complete and work, horn, anchor, oars, 6 life vest are all included. The boat has storage compartments on both sides port and starboard that will hold most of you staple items. No leaks and the windshield is not cracked. The inside is all carpeted with no soft spots. I have some of the original canvas and Bimini top that are included but is not a complete set. It is rated for 6 people and is pretty fast with the 70HP engine on it, but could go up or down to suit your needs. I plan to keep the motor and matching Starcraft trailer for my next boat but will set as a set for the right price in interested send me a message. 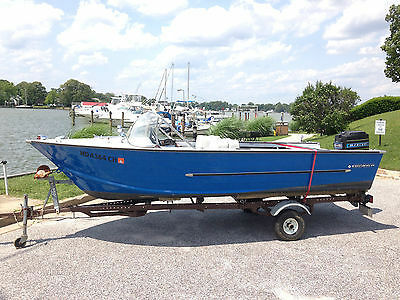 The boat has a clear Maryland title and is being sold as is with not implied warranty or guaranties, all sales are final no returns. To purchase this boat you must use the buy it now option and pay a $500 deposit the balance must be paid in cash at time of pick up. Please ask any questions before buying and no I wont ship it or sell it out side of eBay. 100% positive feedback so buy with confidence!